Sen. Orrin Hatch, R-UItah, speaks during a press conference on Capitol Hill on July 16, 2014 in Washington, D.C. Senator Orrin Hatch (R-Utah), who has been in the U.S. Senate for the last 40 years, announced last week that he will seek an eighth consecutive term in 2018. When Hatch won election to the Senate in 1976, he made term limits a key piece of his campaign against a three-term incumbent. “Senator, you have served the people of Utah for 18 years; it’s time to retire,” Hatch said in 1976 to then-Senator Frank Moss. Hatch apparently doesn’t apply this standard to his own career. 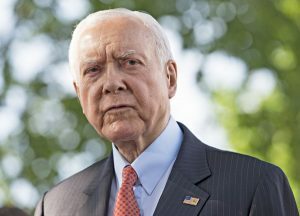 If he wins and serves another term, Hatch will become the third-longest serving senator in U.S. history, beating out Strom Thurmond who served for almost half of the 20th century. Even if he loses, Hatch will still rank sixth. Over the decades, Hatch has held every position imaginable on congressional term limits. He supported it in the 1970s when he ran, then opposed it at the height of the term limits movement in the 1990s. In 2012, when Hatch needed the support of Utah voters again, he reversed course and voted for congressional term limits. Utah Democratic Party Chairman Peter Corroon seized this opportunity to remind Hatch that term limits poll higher in Utah than any other state. A Dan Jones & Associates poll in 2016 showed that 88 percent of Utahns are behind the idea, including supermajorities with both parties. “We thank him for his four decades of dedicated service and remind him that the people of Utah have specifically indicated their desire for him to not run for a record eighth term,” Corroon said, putting it diplomatically. It will be interesting to see whether Hatch can win again in 2018. He will certainly face challengers from both the Democratic Party and fellow Republicans. But one thing’s for sure: If Hatch is re-elected, he cannot be trusted to vote for term limits. When it comes to tenure in Washington, the American people believe less is more. Hatch has a different view and will never be a reliable voice for our issue. Nick Tomboulides is the Executive Director of U.S. Term Limits. Please support term limits on Senator Hatch and career politicians by making a contribution to U.S. Term Limits.